World champion Nathan Chen won the short program with 101.95 points and teammate Vincent Zhou finished second for the U.S., which leads the World Team Trophy. Nathan Chen made no mistakes and landed four quadruple jumps to finish with 323.42 points, successfully defending his title in the men's free skate at the figure skating world championships. Alina Zagitova added a world championship to her Olympic gold medal in the free skate, and Elizabet Tursynbaeva became the first woman to land a quadruple jump at the worlds. Fifth after the short program, Japan's Rika Kihira landed a triple axel and scored 153.14 points in Friday's free skate to capture the ladies' title at the Four Continents Figure Skating Championship. American Vincent Zhou hit both of his quad attempts and was in first place after Thursday night's men's short program at the Four Continents Figure Skating Championships. Bradie Tennell led after the ladies' short. Madison Hubbell and Zach Donohue beat out the team of Madison Chock and Evan Bates to repeat as ice dancing champions at the U.S. Figure Skating Championships on Saturday night. U.S. Figure Skating president Anne Cammett said the accusations of abuse against John Coughlin, who died by suicide last week, need to be "thoroughly reviewed," saying, "If it just ends, there's not closure." Karina Manta and Joe Johnson arrive at the 2019 figure skating nationals proud to be the first LGBTQ ice dance team. But will their openness impact their scores? Two-time U.S. pairs skating champion John Coughlin, who was given an interim suspension Thursday for unspecified conduct, has killed himself, his sister said. He was 33. World champion Nathan Chen and 2014 Olympic gold medalists Meryl Davis and Charlie White will headline a 13-city tour by Stars on Ice this spring. Other U.S. champions including Ashley Wagner will also participate. Nathan Chen overcame a fall on his quad lutz in Friday's free skate and won the gold medal at the Grand Prix Finals with a combined score of 282.42. Japan's Yuzuru Hanyu, the back-to-back Olympic figure skating gold medalist, will miss the Grand Prix of Figure Skating Final because of a right ankle injury. After a nearly two-year hiatus to battle mental health issues such as anxiety and depression, figure skater Gracie Gold returned to competition at the Moscow Grand Prix. Olympic champion Alina Zagitova of Russia returned to gold-medal-winning form in the Helsinki stage of the figure skating Grand Prix series Saturday. Nathan Chen ran away with the Skate America men's title on Saturday, ending with 280.57 points. Michal Brezina of the Czech Republic finished second overall with 239.51 points. Madison Hubbell and Zachary Donohue ran away with the ice dance title at the International Classic on Saturday night, totaling 197.42 points to easily outdistance U.S. teammates Christina Carreira and Anthony Ponomarenko. A man in Kazakhstan has confessed to killing Olympic figure skating medalist Denis Ten, authorities said Friday. Adam Rippon says he tries to have fun with his wardrobe and "just goes for it" with his outfit like he would on the ice. Adam Rippon was the viral star of the Pyeongchang Olympics, thanks to his skating, his personality and his courageous story. Now he dishes on all that and more at his Body Issue shoot. Two-time U.S. pairs champions Alexa Scimeca-Knierim and Chris Knierim have decided to change coaches and will work with Olympic gold medalist Aliona Savchenko and her group beginning this summer. 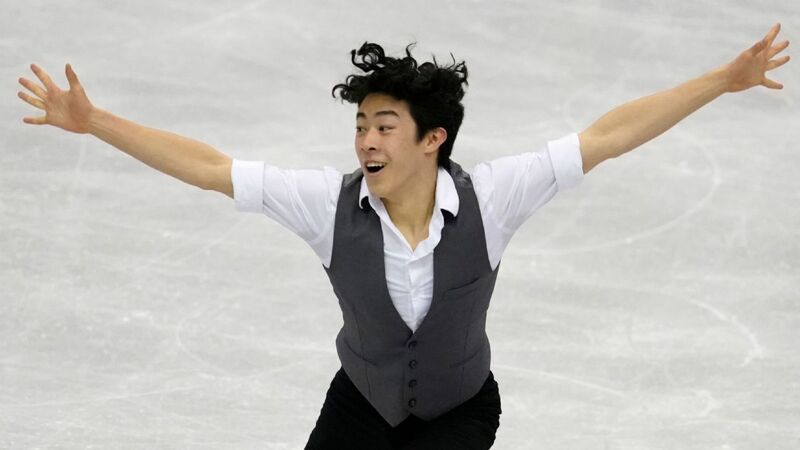 Nathan Chen completed six quadruples and bettered his Olympic free skate score to win the world figure skating title on Saturday. American Nathan Chen atoned for his struggles at the Pyeongchang Olympics by landing two quads and scoring 101.94 in his short program at the worlds, good for first place heading into the men's free skate. Aliona Savchenko and Bruno Massot of Germany, who won gold in pairs skating at Pyeongchang, set a world record to capture the world title Thursday in Italy. American Nathan Chen, coming off a disappointing Olympics, leads after the men's short. Richard Callaghan, coach to Olympic champion Tara Lipinski and six-time U.S. champion Todd Eldredge, was accused of sexual misconduct in April 1999 by a former student.